I often see posts on the BB vs. BB board asking about shell flight characteristics and trajectories, and regarding how much a shell will slow down or if it tumbles during flight. These brief papers will attempt to address various aspects of shell flight, and document my spare time analysis of heavy artillery shell flight. S = surface area of the base of the object. In this case I would use the base area of the shell. For a 16 inch shell, (pi*162)/4 = 201.0619 square inches. .5*rho*V2 is often referred to as dynamic pressure, or "q"
Numerical (Computational fluid dynamics, or CFD. In theoretical methods, simplifying assumptions are made in order to make the problem more solvable. These can involve simplifying the geometry and simplifying the equations. The full equation describing the flow of a fluid around a body are collectively known as the Navier Stokes Equations. These partial differential equations encompass the momentum, energy, and continuity equations of fluid flow. They are unsolvable in a closed form manner ( i.e. plug in what you know, crunch the numbers, and out spits the answer) But they can be simplified for specific geometries or flight conditions. The advantage to this approach is that it can yield a clean formula allowing plug and chug calculations. The con is that is restricted to simple geometries and physics, and usually can only be used on linear problems. Computer costs and run time. Several 'combination' methods exist. These involve compilations of empirical and wind tunnel data combined with computer models of theoretical equations. These can yield acceptable results at a fairly low cost and computer speed. The downside to these methods are that they often require simplification of the geometry, and they include simplification of the physics. Examples of these include Missile DATCOM, the NSWC Aero Prediction Code, and several other variations on the methodology. Many parameters can affect the final Cd. Altitude, surface roughness, spin, and nose bluntness are just a few that can influence Cd, and should be accounted for if maximum fidelity is desired. Once all is said and done, Cd for a streamlined projectile can range from .18 up to .3 at Mach 2. As Mach increases, Cd will generally drop, and Cd will be much higher around Mach 1, due to transonic effect such as shock wave interactions. Accurate kinematic prediction of a ballistic object requires that several initial conditions be known. Velocity, altitude, and angle of flight (commonly called flight path angle, or gamma) Also to be considered is the change in atmospheric density as altitude increases. At higher altitudes, density is lower with the net effect of less drag force acting on the shell. Many atmospheric models exist in both digital and tabular form. My personal favorite is the U.S. Standard Atmosphere, version 1962. These can easily be found in tech libraries or in an aerodynamics book. What keeps the pointy end of the shell in front and the flat end at the back? Or, in other words, why is a shell stable in flight? The rifling of the barrel imparts a spin to the shell that results in a gyroscopic effect on the body. A gyro tends to maintain its orientation, so this assists the shell's stability. The equations of motion for a spinning object can be found in any Dynamics textbook, and generally require detailed knowledge of the objects mass properties. Generally, the farther forward the center of gravity (cg) of a shell is, the more stable it will be. The cg is the point along the length of the where the same amount of weight is in front as in back. The point where it balances. Other mass properties of import are the moments of inertia of the shell. These are numerical representations of where the weight is located in an object and how it is distributed. Unfortunately, shells tend to be statically unstable. This is due to their very shape. Pointy at the front, then a near constant diameter along the rest of their length. In flight, pressure builds up along the surface of an object. A surface more perpendicular to the line of flight tends to have a higher pressure, like when your hand is out a car window. Flat, it doesn't have much force on it, but if you turn it on its side then you can feel the increase in pressure. For a shell, this means that most of the force is toward the front, where the pointy end is. The point where this acts is called the center of pressure, or Xcp. Xcp is found by calculating the pressure distribution across the body, then integrating it. The resulting point where the resultant of all these forces lands is the center of pressure. Of importance is that there is no force acting on the sides of the shell if it has no angle of attack. This means that it is pointing perfectly straight. If it has a slight angle, then the side that is exposed more to the airstream has a higher pressure, much like the hand out the window analogy. For stability, think of the shell as a teeter totter with the pivot placed at the cg. 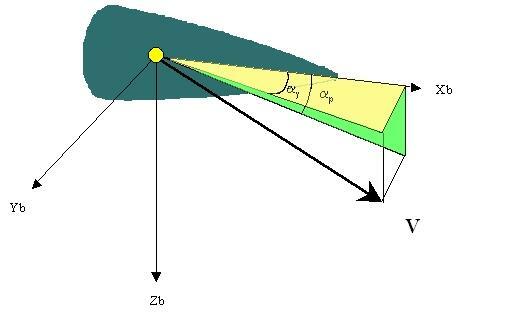 If the Xcp is behind the cg, then if the shell takes on an angle of attack then it will have a tendency to correct itself. The aerodynamic force will try to straighten the shell out. If the Xcp is in front of the center of gravity, the tendency is for the angle of attack to get WORSE, causing the shell to tumble. A good shell design will combine the aerodynamics, the mass properties, and the spin of the shell to permit the projectile to be pointy end forward for the entire flight. Unfortunately, the very shape of a shell contributes to instability. A WWII era shell generally had a windscreen on the front, and most of the weight concentrated towards the rear of the body. If no spin was imparted by rifling, the shell would tumble or stabilize at an angle of attack near 90. This is undesirable, since it means that the shell would be flying sideways (not good for range or penetration). Recall that this is only a portion of the information needed to design a shell. Penetration and explosive power must also be addressed.